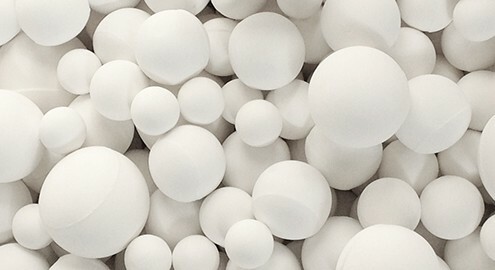 The alumina balls made by Hito Technical Industries, HITO 92HD, are balls with a minimum of 92% of alumina content, and the balls with the highest density of the market. Hito Technical Industries, S.L., produces all kind of trapezoidal (wedge) bricks, rectangular, adjustments, finished row bricks, etc…, that in a proper combination can line complete mills with diameters from 600 mm up to 3,800 mm. Hito Technical Industries, S.L., with three decades of experience at this specific sector, offers the best solution to protect the mills, through their high performance ceramic linings. The Hito Technical Industries, S.L. alumina wear resistance pieces, are characteristic by their high mechanic properties, which give them and excellent performances in front of the wear. Hito Technical Industries, S.L., specialized company in the manufacture and distribution of grinding media, presence in over 40 countries, introduce a new product: Nanobeads ZH. “Ceramic Proppants” are used exclusively at the hydraulic fracture process (“fracking”), for the exploitation of not conventional natural gas deposit reservations (“shale gas”).